Jake Kirby – a graduate of MTC’s Ambassadors Program – has discovered, earlier than most, what he would like to do with the rest of his life. Since graduating from the program in 2015, Jake has gone on to win a VCE leadership award for his contribution to secondary school, been selected to perform at VCE Top Acts, and has secured a number of work experience placements at some of Melbourne’s leading theatre companies. In 2013 Jake started a not-for-profit organisation called Kids Like Us (KLU), which focusses on improving accessibility for students Jake describes as, ‘twice exceptional – they have a disability and a gift’. It’s safe to say Jake is a go-getter. After finishing his year-long engagement in the Ambassadors Program, he made a concerted effort to find work experience with as many industry professionals as he could. He started his gap year in 2017 shadowing renowned Lighting Designer Richard Vabre on MTC’s second production of the year John. Jake told us a bit about his time as an Ambassador; what he has learnt from the best in the business; and why he is so inspired to embark on a career in professional theatre making. What did the Ambassadors Program do to ignite your passion for performing arts? I think the biggest thing the program did was open my eyes to the enormity of the professional theatre world. It exposed me to roles inside theatre that I didn’t know existed for example, a dramaturg. Also talking to like-minded people who are passionate about the same things as you is always an inspiring experience. What, in the Program, stuck with you the most? The talks that we had with industry professionals was the thing that stuck with me the most, seeing the expertise and passion they had for their work made me want to be part of their world. Where did your curiosity for theatre design begin? My first curiosity for theatre design began in Year 8 where I had the opportunity to do design work for a youth theatre company; I was also inspired by a family friend who was producing the most amazing set designs. Since then I have been involved in theatre design for various school productions. Then, at the end of Year 10, the theatre manager at school said, ‘We’ve got some externals hiring out our theatre; can you go in and do some lighting for them?’ And I had no idea what lighting was, but I went in and that’s how I got into lighting. How did you find yourself working alongside Richard on the Australian premiere of John? I met [John’s Lighting Designer] Richard Vabre in 2015 doing work experience on Ricercar at Theatre Works. Since then I have remained in contact with him. This relationship with Richard and my previous involvement in MTC’s Ambassadors Program meant that MTC was happy for me to act as Richard’s secondment for this production. In late December, I caught up with Richard and he brought me up to speed with the design concept for John; his initial ideas, specific lights that are built into the set; and his general feel of what the play was. I read the play, did my own notes, and analysed the script. Jake Kirby and Richard Vabre in the John rehearsal room. What happened in the first week of rehearsals? Then, during the first week of rehearsals, [John Director] Sarah [Goodes] ran discussions for a week. And that was the most amazing thing to watch and be part of. The cast and creatives broke down and discussed the script and each day I came home thinking, ‘This is what I want to do. I can do this. I want these discussions every day.’ There was such a wide range of topics they were talking about – from mental illness, to supernatural beings, to the human condition. Such deep discussions that I very rarely experience. And the knowledge these people had was inspiring; for example, I remember Helen [Morse] coming in and she had piles of books and could talk about every little detail in the script. It was amazing. What is unique about the lighting in John? The lighting plays a key role in John. It’s like another character. Lights are switched on and off by actors. Little Christmas lights flicker on and off, and little buildings twinkle with lights inside them at the start of the show. The whole story is sort of building up to a scary story, and the lighting creates dramatic tension. What are you most looking forward to on Opening Night? Seeing what I’ve been a part of. I’m not super, super involved, I’m more like a fly on the wall, but to see what I’ve been part of and how the show’s developed from the first read-through. I think I’ll be very inspired. I’m already very inspired. How beneficial do you think work experience is in fostering career development? Hugely beneficial. Seeing this whole process has given me a completely different insight into how a show is created. I was able to get this secondment because I had been part of the Ambassadors Program. This whole process has developed my understanding of the role of lighting and how prepared you need to be to create a professional standard and execute it really well. What advice would you give to students wanting to follow a similar path? Take every single opportunity that presents itself and also, make opportunities. Don’t be afraid to contact someone and say, ‘Hey, can I come and join you? Can I be part of what you’re doing?’ Just know that the worse reply you can get is a ‘no’. 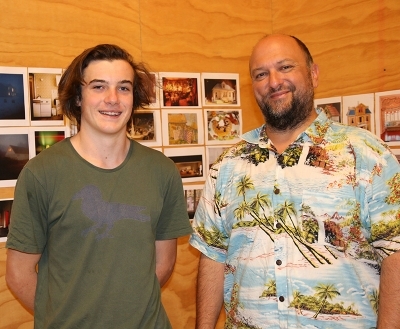 Jake plans to attend either WAAPA or VCA in 2018 to study Theatre Production and Design.